Dictators & Dreamers investigates infamy, the ripple effects of power, human rights issues, and dreams of the (seemingly) common person. This body of work contrasts the faces of current or recent absolute rulers of countries around the world with the faces of immigrants, refugees, international students, and asylum seekers now residing in the Cedar Valley. The Dictator is infamous. Dreamers are often anonymous. Now, they hold equal attention. Jennifer Lynn Bates is an Instructor of Fine Arts at Hawkeye Community College. She earned a Master of Fine Arts in painting from Pratt Institute and a Bachelor of Fine Arts in art and design from Iowa State University. 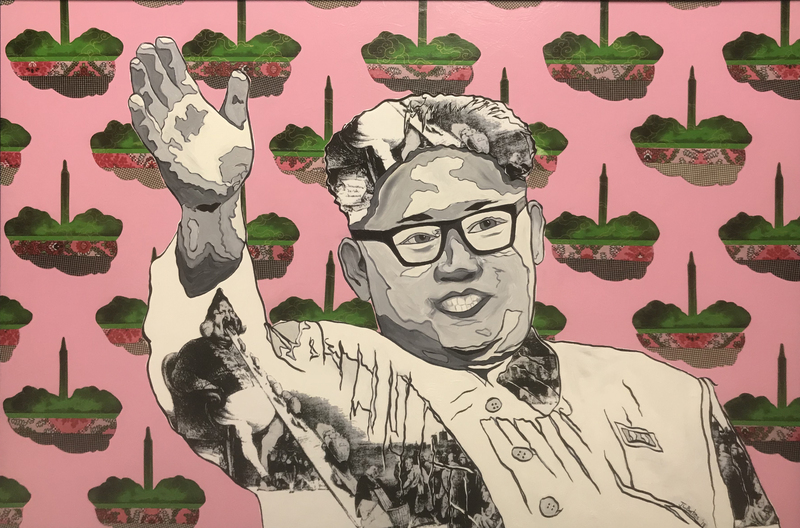 Bates’ artwork is inspired by Pop-Art humor, the bold colors of Cuban political posters, and the flat patterns of Henri Matisse and 19th century decorative art.